In return for: Historic Preservation Restriction, Public Access to the Jones River from Landing Road, Providing Housing for Students in Higher Education, and Research and Monitoring of the Changing Environment in the Jones River and Kingston Bay. The Jones River Landing Environmental Heritage Center is a nonprofit membership organization, established in 2003 as the headquarters for the Jones River Watershed Association; which for decades has worked to preserve, protect and enhance the water resources of the region for the people and the environment. At the Landing, we engage in education, advocacy, science, stewardship, wooden boatbuilding, recreation on the water, and related public programming. We have also worked with various schools in an array of undertakings, including studying the marine environment, building small boats while teaching math skills, monitoring water quality in the river and bay, and assisting college interns in advancing their education. Over the past 15 years, our volunteers, members and contributors have invested considerable effort and resources to bring back to life the local history and traditions that have made the Commonwealth a success. The Jones River can legitimately be called the workhorse of America. From the earliest settlement of the Plimoth Colony in the early 1620’s, through the War of Independence and the struggles of the centuries since, the water, fisheries and industries of this place have continued to power the country and sustain our communities. Declining public access to the waterfront has been a hot-button issue for Massachusetts in recent years. Wealthy property owners have scooped up traditional areas of working waterfront and restricted access to the surrounding communities. While many communities have fought this trend through painful and expensive lawsuits, the Landing has taken a more proactive and holistic approach. We have sought to protect, preserve, and even expand the functions and access of historic working waterfronts in Kingston. The Stephen Drew Heritage House is a continuation of that mission. Our plan for the Heritage House is to provide additional structure and momentum for our relationship with education, while reconnecting the historic properties of the famous Jones River Landing and preserving opportunities for residents to connect with the river. We have the skills needed to restore the house because of the talented volunteer base we have cultivated over many decades. Housing for students can be difficult and costly, yet it is highly desirable. We have begun reaching out to area colleges and universities to evaluate interest in the idea of housing upper level students at the Heritage House while providing support and facilitation through the Landing’s maritime assets and ecology programs. Everyone we have spoken with, from assistant deans to scientists and state agencies, are interested in this opportunity and in helping to develop a curriculum. Today, we are asking you to act on behalf of the Town to help us realize this goal: restore a unique historic house and repurpose it, while maintaining its historic interest, to provide education and stewardship of this remarkable area and enhance public engagement now and for future generations. The history of the Jones River is the history of the United States. 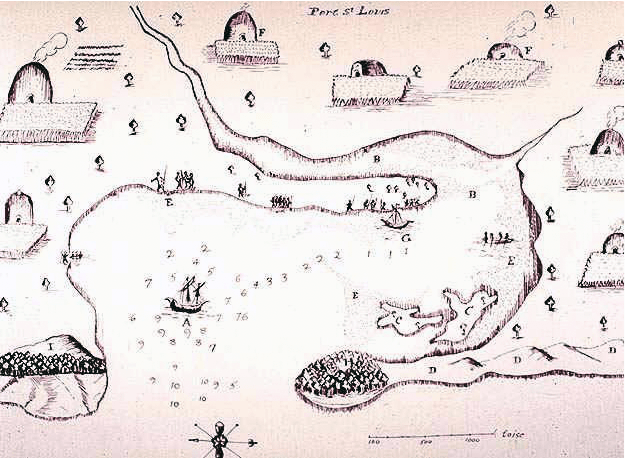 In 1605, Samuel Champlain visited and charted what is now Kingston, Plymouth and Duxbury Bays. When the Pilgrims arrived in New England in 1620, they recorded traveling at least three miles up the Jones River in search of a settlement site. They named the river for their captain, Christopher Jones. John Bradford, son of the longtime early governor of the Plimoth Colony, moved to the Jones River Landing area in the mid-1600’s. By the 1700’s, the Jones River became critical to the growing country as a location for shipbuilding and supporting industries. 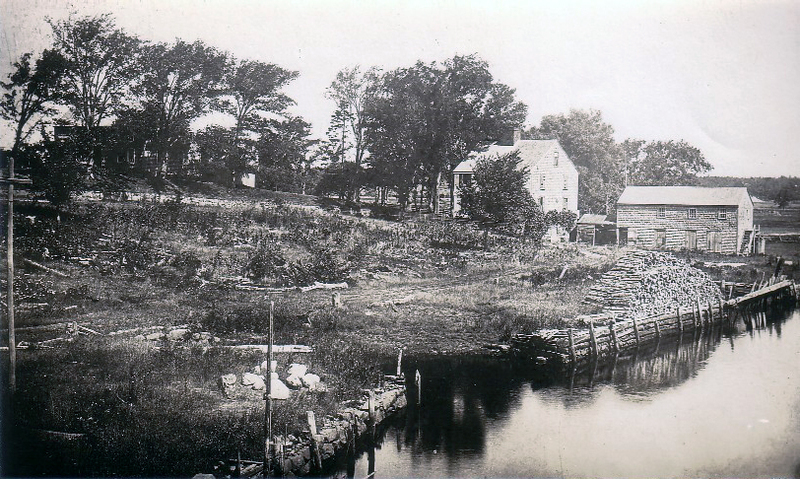 View looking down river of the Stephen Drew house, built prior to 1800 on land once owned by John Bradford. A pile of cord wood awaits loading on the wharf. The building to the right is Joiner’s loft. Plan of the Landing Place in the Town of Kingston showing Probable Ownership in 1800. From Ships of Kingston, 1926. During the period between 1776 and 1898, records indicate approximately 270 vessels, from 20 to 611 tons were built along the banks of the Jones River. 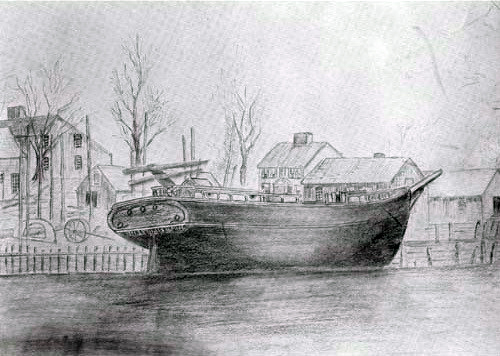 Pencil sketch of the Brig Helen A. Holmes, built by Spencer Drew and Edward Holmes, just launched and awaiting finishing out at the Drew yard. The Drew house and other shipyard buildings can be seen on the far side of ship. 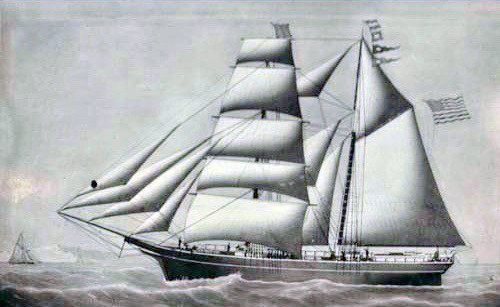 Hundreds of ships like the Helen A. Holmes, built in Kingston, Massachusetts sailed the world engaged in commerce that built America into an international trading powerhouse. Helen A. Holmes in the English Chanel, 1874. 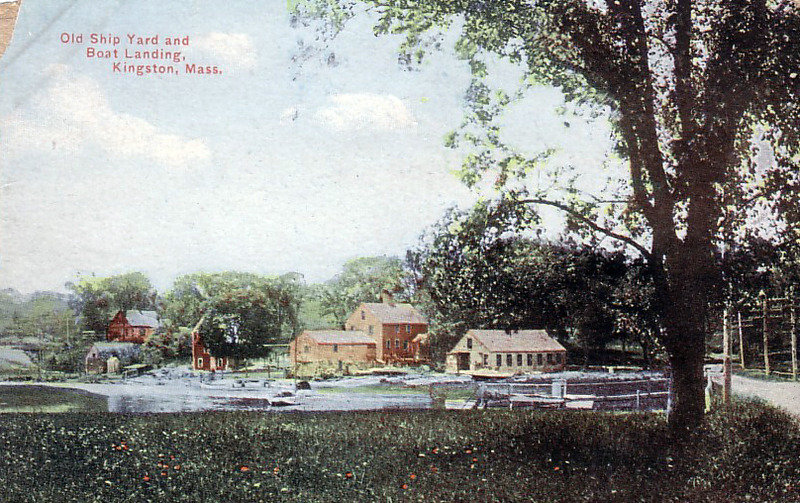 Stephen Drew house (right center) and John Bradford house on hill behind trees. 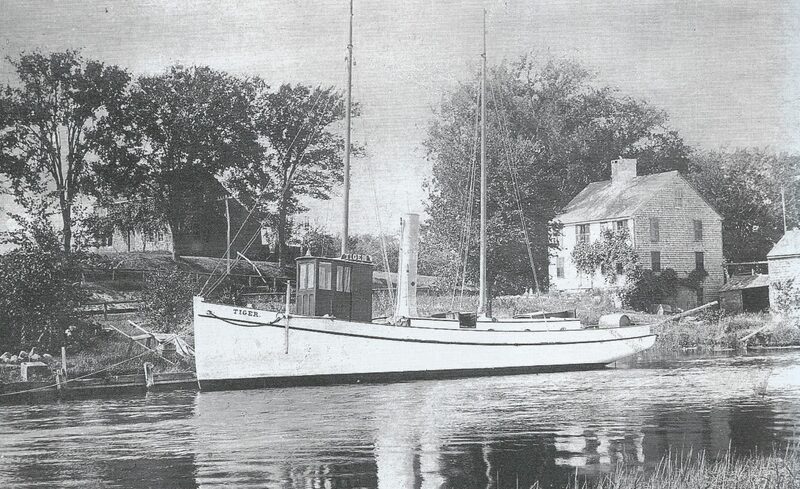 Tiger, the only steamer built on the Jones River, constructed by Edward Ransom upriver from the Drew house. Images courtesy of the Kingston Public Library unless otherwise noted.